In the company of the team at Alagadi Beach (30 minutes drive from kyrenia) you can share this unique event. And there, before your eyes, you can witness this one hundred million year old wonder, as soon after the other these mother-of-pearl shimmering eggs, the size of table tennis balls, are dropped into the nest cavity. On a lucky night you will be able to experience this unique happening several times before you return to your hotel, tired but happy. Incubation is indeed not by the female turtles but by the warmth of the Cyprus sunshine. After about 50 days the small hatchlings begin to emerge from the surface of their sandy nests. 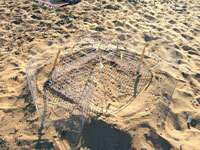 This is another fantastic experience that takes place in some forty nesting beaches around Northern Cyprus. All are welcome to participate in this event as well to witness up to a hundred of these amazing little creatures, not more than 6-7 cm long, fight their way from the nest down to the sea, is an unforgettable sight. It is sad fact that only one in thousand survive. Even less would survive if it was not for the special conversation project taking place here in North Cyprus concerning this endangered species. We feel it is our responsibility to help these creatures to survive and to be able to continue, without threat to their nesting grounds, to visit our island. This has been their home much longer than it has been ours. The best times to observe the nesting is at the end of June and beginning of July. To observe the hatching is the best during end of August and beginning of September.